Come In and Experience A Perfect Fitting! That Special Woman is Toledo's original and largest mastectomy and chemotherapy boutique since 28 years. With our knowledgeable staff on hand, we can fit and size you for wigs, hair pieces, mastectomy breast forms, apparel and prosthetic devices. We have been nationally accredited since 1990 and participate with Medicare, most Ohio insurance companies, Ohio Medicaid, and some Michigan insurance companies. Please call (419) 442-0296 to verify your insurance coverage, or ask us at the time of your visit and we can call your insurance company for you. That Special Woman carries five different styles of breast prostheses in all sizes so we can fit you in one that resembles your remaining breast as closely as possible. We also have bras to fit everyone including regular and large size non-mastectomy bras from top companies. If we do not have a specific bra in your required size or color - we will find it for you! 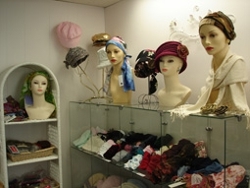 We carry more than 125 wigs and a full selection of beautiful headwear! If you want a custom wig, We will happily special order a wig for you. At That Special Woman, we guarantee the lowest wig prices in Toledo and never charge a fitting fee! Goddess, Fantasie, Carnival, Aviana, Glamorize, Anita and More! For Quality Prosthetics at Affordable Prices, Call Us! Copyright © 2018 thatspecialwomanoh.com All rights reserved.